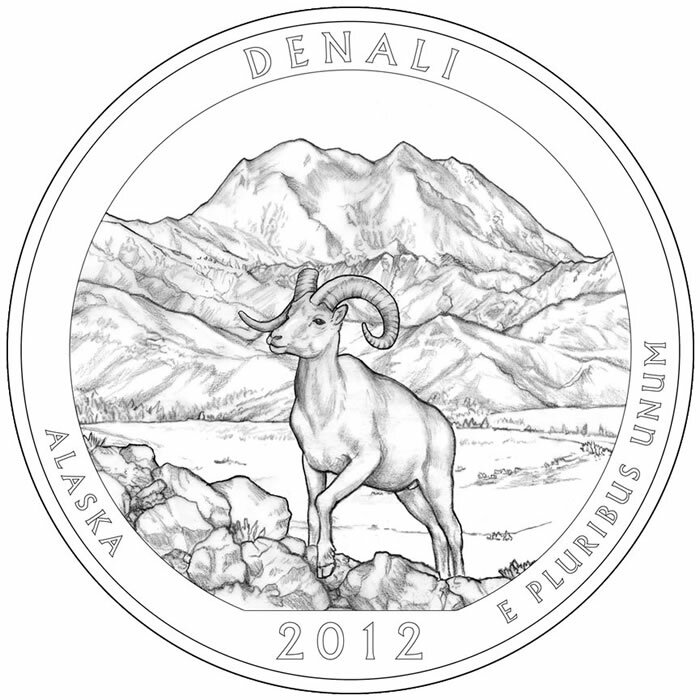 The Denali National Park Quarter honors the national park and preserve located in the state of Alaska. It completes the collection of 2012 strikes in the United States Mint’s America the Beautiful Quarters® Program. Released on November 5, 2012, the quarter is the fifteenth in the series which debuted in 2010. 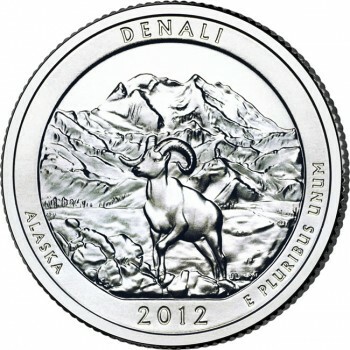 Shown on the reverse or tails side of the Denali National Park Quarter is Susan Gamble’s depiction of a Dall sheep with Mount McKinley rising in the background. Jim Licaretz is credited with its sculpting. Several designs for the reverse were reviewed in early 2011 by groups and individuals along with the design candidates for the other four coins of the program issued in 2012. Comments from those reviewing it were then given to the Treasury Secretary who had the final say. The United States Mint announced the final selected designs for the 2012 quarters on December 8, 2011. All of the coins of the program, however, feature the same obverse design. It is a portrait of George Washington, the first President of the United States, as designed by John Flanagan for the 1932 circulating quarter dollar. 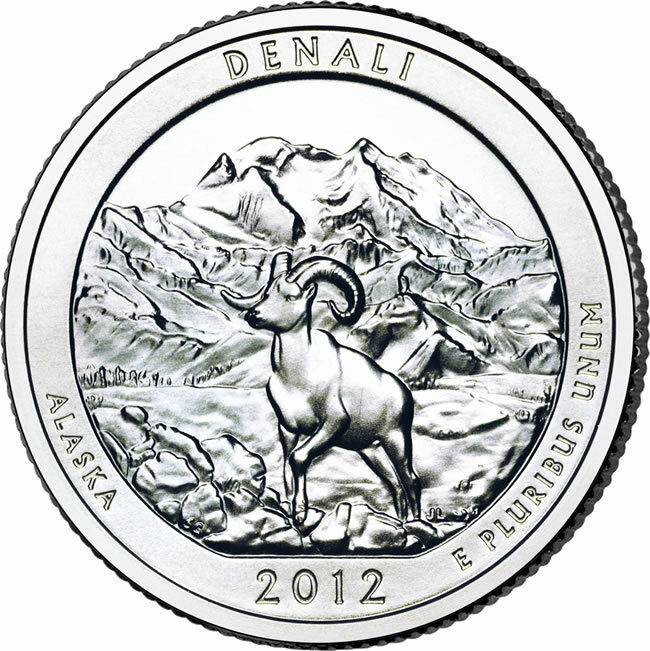 Four strikes precedes the Denali National Park Quarter in 2012. The were the El Yunque National Forest Quarter, Chaco Culture National Historical Park Quarter, Acadia National Park Quarter, and the Hawaii Volcanoes National Park Quarter. 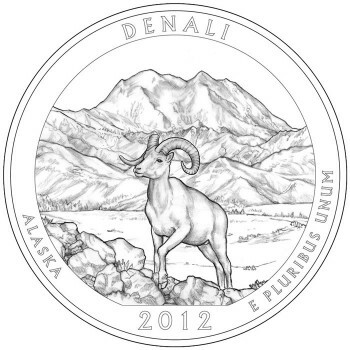 Denali National Park of Alaska was created in 1917. The name Denali means "the high one," which is a proper name for the park as Mount McKinley (known to the locals as Denali) is the highest mountain in North America. It stands over 20,000 feet high. The national park is just less than 9,500 square miles and is often difficult to travel to. In the winters, the snow fall can be atrocious and it can take weeks during the spring to clear from the roads. Those who do visit the park, though, are treated to some of the most spectacular views of scenery and wildlife offered in the world. Each year, an estimated 1.1 million visitors visit Denali. They are allowed to stay at the camp grounds, explore the terrain, learn about the wildlife that inhabit the area, or even take several of the guided tours offered.